Slot games are highly sought after as they offer great gaming experience, the aesthetics, and the RTP. 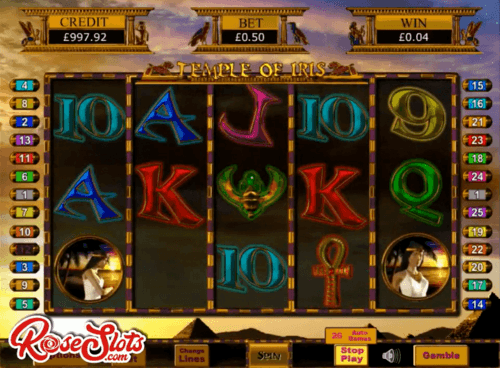 In this guide MoneyReels have provided the top 5 Egypt themed online slots that you will enjoy playing. This slot game by Eyecon allows you to explore the ancient and Egyptian Temple of Iris in search of temples. The graphics are exciting and the features that are seen on the reels are impressively rewarding. The theme of Temple of Iris is Egyptian related as it takes you back to ancient Egypt. Temple of Iris features free spins where you can earn up to 15 free spins, 5 reels, 25 paylines and an RTP of 95.4%. You can stake this game with a minimum of 1.00 bet to a maximum of 25.00 bet. This game is definitely entertaining. Hidden is a slot game powered by Elk Studios. During play of this entertaining Egyptian themed slot game, you will see the reels standing against the pyramid of Giza backdrop. The graphics are well designed that they offer you an immersive experience during play. Hidden slot game features 5 reels and a remarkable 178 paylines. With an RTP of 96.3%, this game has wild symbols, scatter symbols, free spins and re-spin features and other inventive features. The symbols that are seen on the reels are ancient Egypt related icons such as the sphinx and camels. 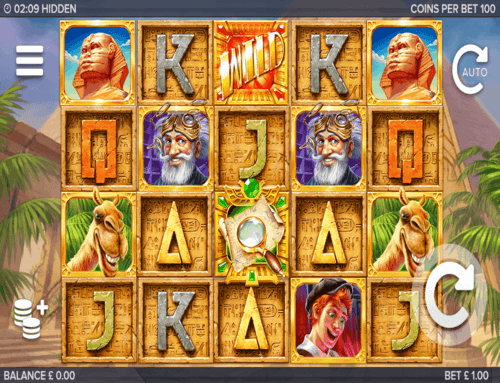 This is another Egyptian themed slot game by Playson. Kingdom of the Sun: Golden Age features 5 reels and 15 paylines. This game is designed to highlight the ancient Egyptian culture. To corroborate this claim the highest paying symbol of the game is deeply linked with the ancient Egyptian tradition. The graphics of Kingdom of the Sun: Golden Age is wonderfully designed and gives you a nostalgic feeling about ancient Egypt during play. The reels are against an oasis background. This Egyptian slot game has free spin features, wild symbols, an RTP of 95.29% and other fascinating bonus rounds. 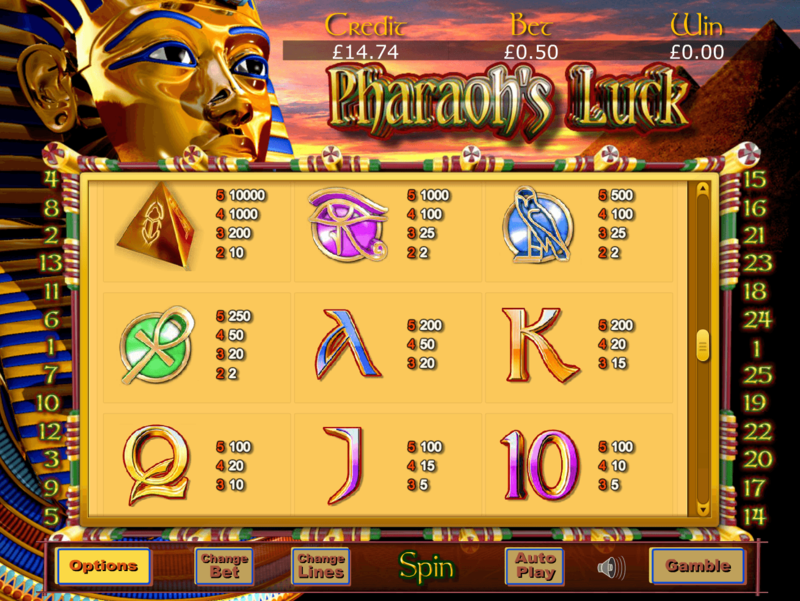 Eyecon, an Australian software developer brings to you another Egyptian slot game titled Pharaoh’s Luck by Eyecon. This 55-reel and 25-payline slot game boast of quality looking graphics. The animated theme is ancient Egypt inspired. 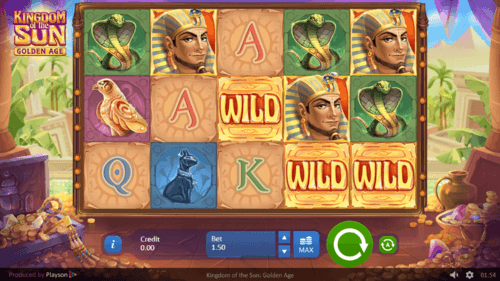 Starting with a minimum bet of 0.01 and a maximum of 0.20 coins on the active paylines, you can be on your way to enjoying the free spins features, substituting wilds, scatters, and the Egyptian related symbols on the reels. Pharaoh’s Luck by Eyecon has an RTP of 94.00%. Get ready to enjoy this promising Egyptian slot games powered by the top software provider Microgaming. 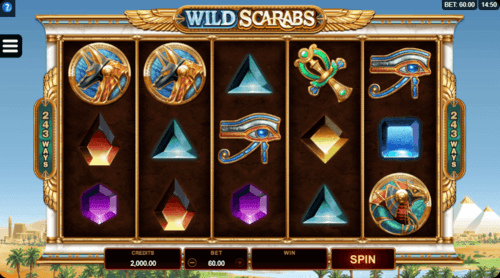 Wild Scarabs slots game has 5 reels, 3 rows and 243 ways to win. This game has wild and scatter symbols, free spins feature that is activated by landing three scatters on an active payline, a wild deal feature that adds more wilds to the reels and other enthralling features. Wild Scarabs also has an RTP of 96.00%. These games can be played on www.MoneyReels.com. They can be enjoyed most on mobile devices of any size and desktop.